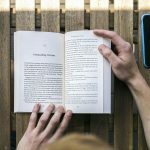 If you are a self-publishing author who wants to know how to typeset a book, there are plenty of tools and resources available to you. 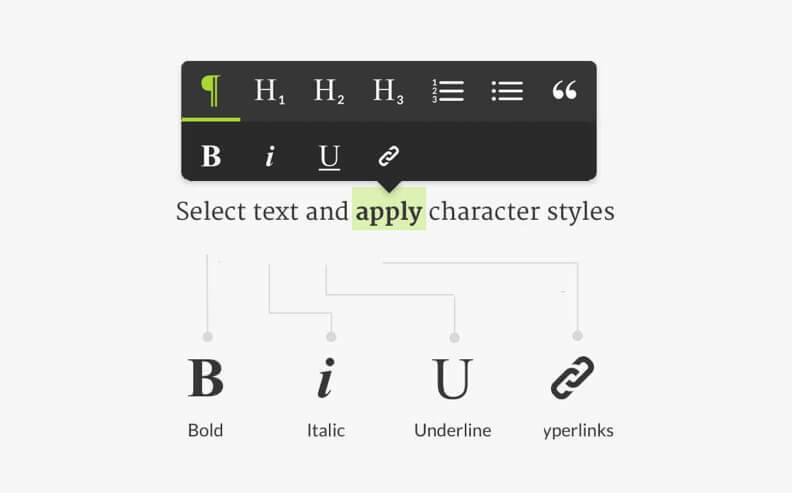 Many choose to digitally typeset a book in Word — but writers shouldn’t just make this choice by default. Ensure you take the time to explore the different options available for formatting your manuscript because a clean design is a vital part of publishing success. 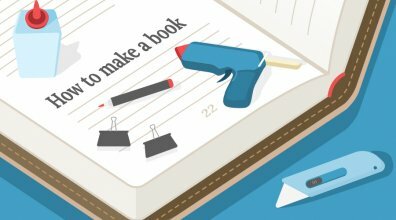 Why should I use the Reedsy Book Editor? And did we mention it’s fast? We tested the RBE this morning and were able to typeset an 80,000-word novel in under 10 minutes. 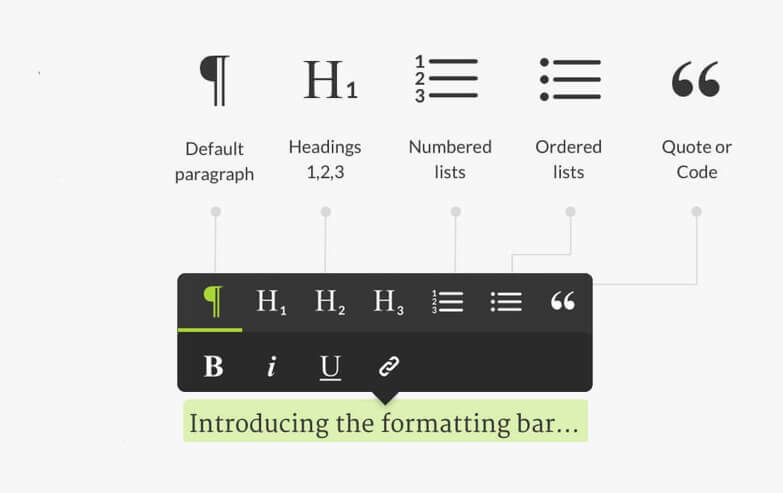 Looking for a professional formatting tool? 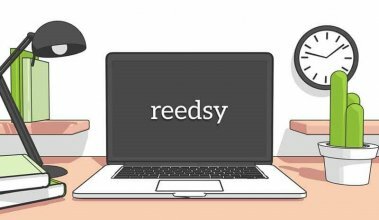 Sign up for free to start using the Reedsy Book Editor within seconds. But before you set your timer, let’s quickly cover why it’s so important to come to market with well-designed book interior. The readability of a book depends entirely on how your manuscript is formatted. A work with poor readability, well, probably won’t be read — and won’t sell. 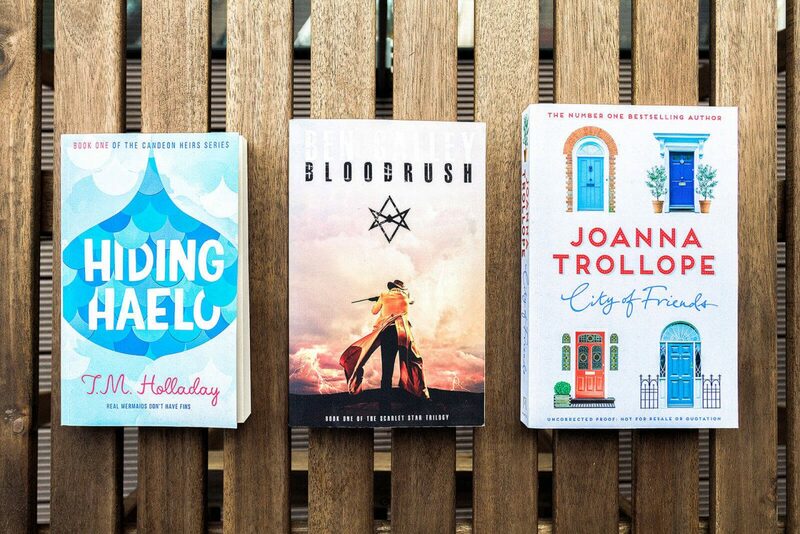 So if you want to go toe-to-toe with traditionally published titles, your product needs to look its best, inside and out. While cover design is critical for a reader's first impression, interior design and typesetting shouldn’t be overlooked. 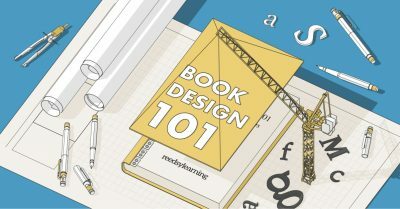 For more information on typesetting, check out our guide to interior book design. To go toe-to-toe with traditional titles, your product needs to look its best, inside and out. The art of typesetting is not new. In fact, manuscripts produced during the medieval era conformed to a well-defined set of rules that publishers today are still following. The canons of page construction, for example, describe how a manuscript’s proportions, margins and type areas (print spaces) should be constructed. But we know that learning the technicalities of making a book can’t be learned overnight and that hiring a professional interior designer for your manuscript might not be in every author’s budget. So let’s get on to your DIY guide on book formatting. There are plenty of ways to skin a cat (or, in this case, format a book). 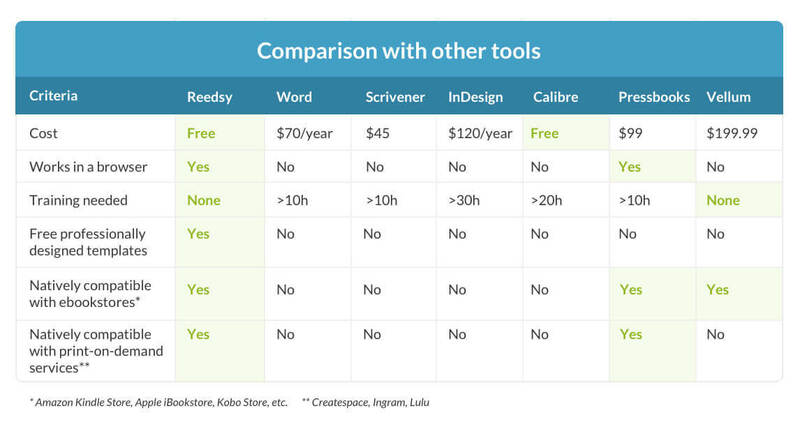 In this section, we'll show you the easiest way to get professional results using Reedsy's free online formatting tool. 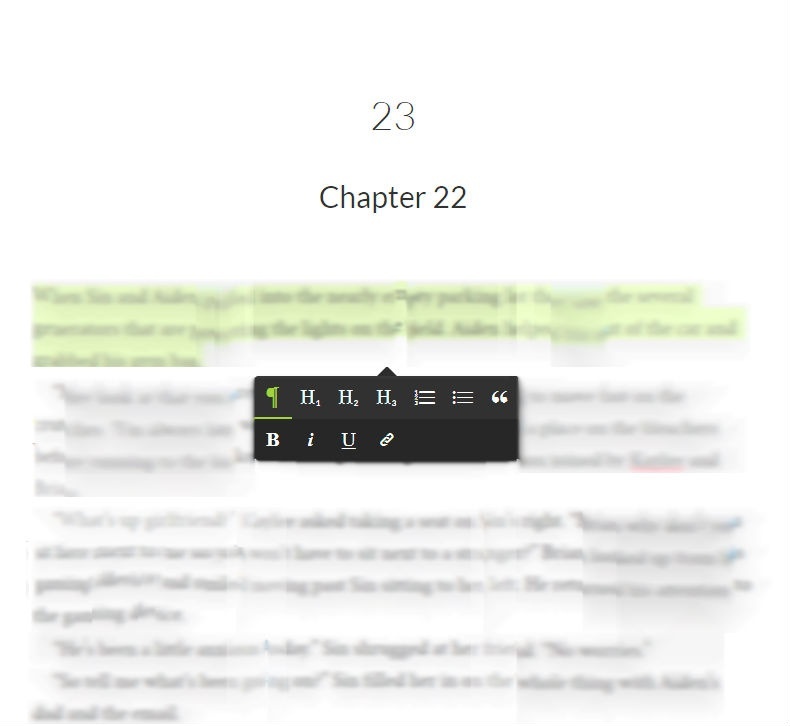 Using "chapter …" at the beginning of every chapter. Once your manuscript is nestled comfortably into the editor, the formatting can begin! 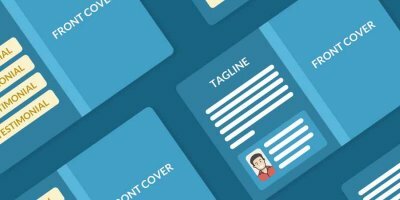 One feature that makes our book production tool really smart is the formatting bar: simply select the type of paragraph or character style you want to use and the formatting will be applied. At this point, your manuscript’s interior is taken care of and it’s time to focus on its exterior. 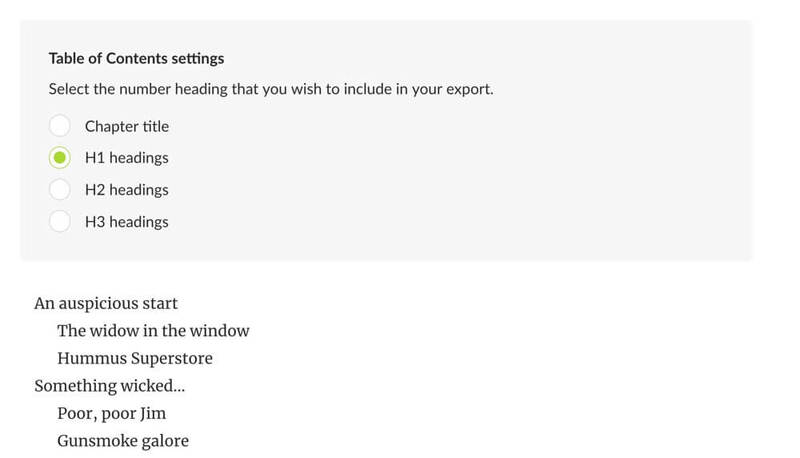 You can now click on the Export icon which will lead you to our Export page — where most of the magic happens. The first thing you should do here is to upload your cover. Make sure you upload an image that follows the requirements of the ebook stores you are using for distribution. For best results, we recommend your cover image use a ratio of 1:1.6 and measure at least 2500px on the longest side. 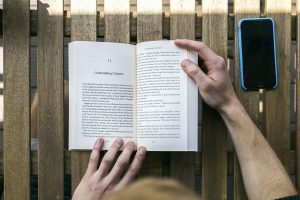 But if you’re not sure, check out our handy guide on how to choose the right book cover dimensions. Note that for physical books, POD services will require both a PDF with the full jacket and a separate PDF for the book’s interior. For the book’s jacket, we recommend working with a designer from the Reedsy marketplace who knows the requirements of different POD services and will be able to provide you with the right file. Check out these formatting tips for producing a beautiful, professional-looking book. “Front matter” refers to the parts of your manuscript that come before the actual content begins. 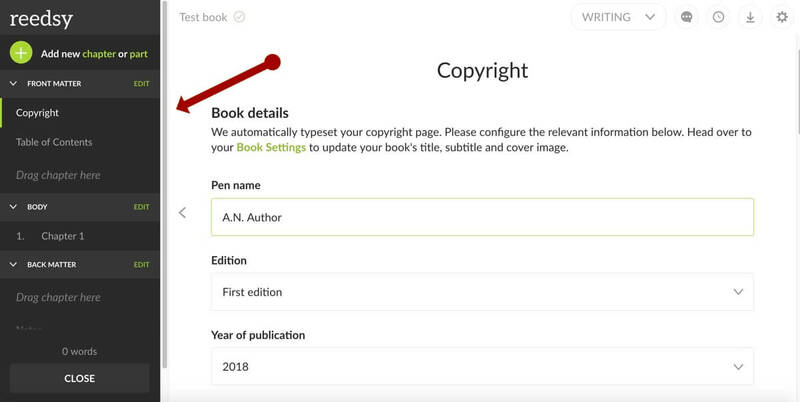 With the Editor, you can manage your book's front matter elements in two sections: the Copyright Page and Table of Contents. Note that you won’t need an ISBN for most ebook retailers, as they have their own identifying number. For instance, Amazon uses the Amazon Standard Identification Number (ASIN) and creates a new one for free every time you publish with Kindle Direct Publishing (KDP). Similarly, Apple iBooks no longer requires an ISBN. There’s currently a debate about whether or not ISBNs still make sense, and you can read more about it here. For now, you’ll still need an ISBN if you’re planning on printing POD versions, and most POD services will provide you with one for free. Once your ISBN has been added, you can turn your attention to your table of contents. This is where you can choose how detailed your table of contents will be. If you're writing a novel, you may only want to list the chapter titles in the table of contents (above). However, you can also choose to list your sub-headings as well (below). And once you're done with configuring your copyright page and table of contents, you're just about ready to export your book. EPUB files are compatible with Apple’s iBookstore, the Kobo Store, Nook Press, Google Play and NetGalley. Mobi is the proprietary file format used by Amazon's Kindle Store. When you export your ebook from Reedsy Book Editor, you will have the option to select either or both of these formats. 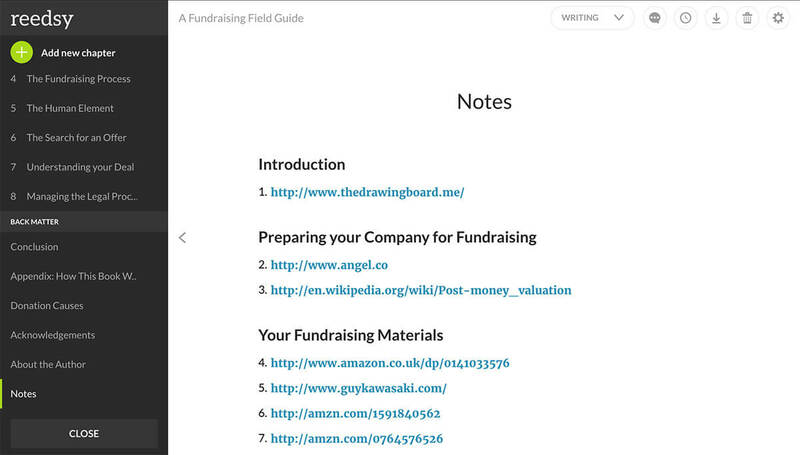 Next, decide how you’d like to organize your endnotes (if applicable). 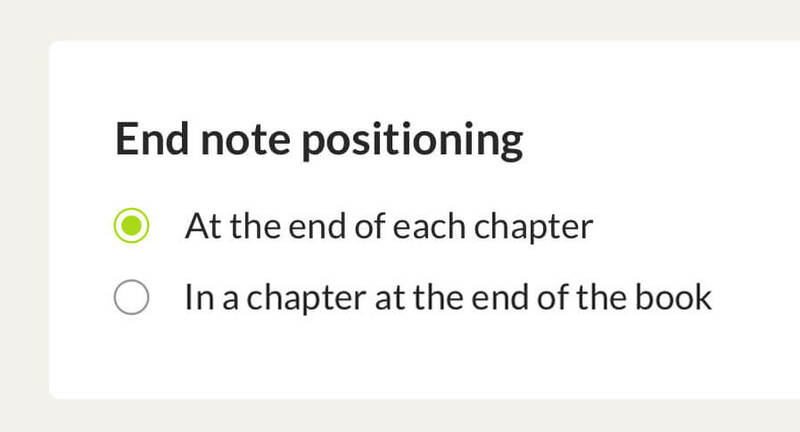 You can either have them positioned at the end of every chapter or all together at the end of the book. The files created are currently compatible with most POD services (Lulu, KDP Print, IngramSpark, CPI, etc.). Again, the first step is to position your endnotes. For physical copies, you can decide whether you’d like them to be footnotes at the bottom of a page, or actual endnotes at the end of your book. Which trim size should you pick? There’s no clear-cut answer. Your choice depends on the genre and audience of your book, the length of the manuscript, and, of course, your personal preference. To make a decision here, we recommend that you spend some time in a bookstore with a ruler to determine what makes the most sense for your future bestseller. Once you’ve selected your trim size, simply pick a template and hit the download button. Your moment of glory is only seconds away as the editor typesets your book and gets it ready to be downloaded! As a bonus, we have a short video tutorial for formatting your manuscript in the Reedsy Book Editor. 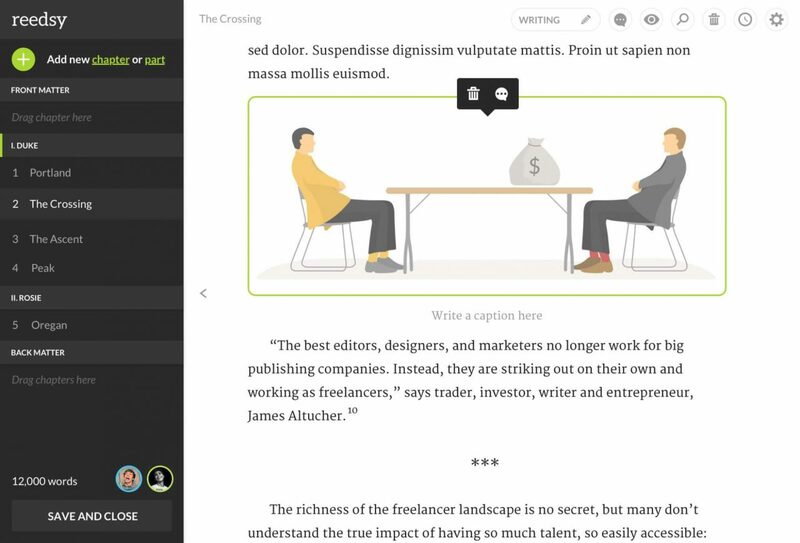 Head to our Reedsy Book Editor and format your book for free, in just a few seconds. And if you have any questions or feedback, feel free to let us know in the comments below. The Reedsy Book Editor really is an amazing resource for indie authors, as I know from experience! But I'd still like to see the option to add 'untitled' front matter, such as a quote... and an option to remove/change the formatting of lower case, italicised roman numerals page numbers, which I guess is a feature more common in the US than the UK. How does it handle footnotes? I have seen published novels where footnotes appear as pop-ups without having to navigate away from the page you're reading. That's the format I'd like for my work. I'm working in the book editor right now, and there are significantly fewer options in the formatting bar than what is pictured above. My only choices are regular paragraph, headings 1,2,3, block quote, numbered list, bullets, bold, italic, underline, and hyperlink. I'm particularly looking for the sans paragraph font and the center text options, where did they go? Hi Kate, the formatting bar images on this post are slightly ahead of our roadmap — the alignment and sans paragraph font will come within an update of the Book Editor in a month or so (i.e. Oct 2017). Sorry about that! I'm still not seeing alignment, is it available? I want to love Reedsy's ebook creator so badly. It has a beautiful interface and produces a nicely templated book. BUT it's light on one too many features. Section breaks do not work. Center adjustment isn't available. Hyperlinks on pictures would be useful. As someone mentioned, all of the "front matter" is considered chapters and roped into the Table of Contents. I'd like to be able to put a dedication and a teaser for another book before the ToC and not have it show up on that list. Any word on when the new features will be coming out? Not sure. I never revisited this product. I went with vellum, which was a pretty penny, but did exactly what I needed it to do. Is there an option to justify text in the Reedsy editor? Hi Joanna, Your text will be automatically justified when you export it. We give you the best experience to write and our tool takes care of the formatting itself at the end. This is a great tool. I'm working on formatting a paperback and I don't see where I can force chapter/title pages onto the right hand page. And alternatively the copyright notice needs to be left hand page. Is this something that can be done and I can't locate the functionality? Or is it a feature that's coming soon? This isn't a feature that's available. We don't allow for infinite customization as we really want to avoid users making basic typesetting mistakes. We'll probably add templates in the future though where chapter and title pages will be formatted differently. I'm wondering why the text for a typesetting/formatting software cuts off the last few characters of each line of the preceding explanatory website text. This blog entry was supposedly updated in September 2017. Has no one noticed this? Not a particularly good first impression. I guess you get what you pay for. What do I do if it returns a failure on me whenever I try to export a book? There's not even a notice telling me the reason it fails. Our team is instantly notified whenever there's a failed export, so they can look into it. Please allow a few days until they get back to you and identify the issue. In downloading a word doc onto the ebook creator my endnotes come out numbered in Roman numerals in the text instead of in standard numbers ( I have many endnotes) and the reference appears at the end of the chapter instead of the end of the book. I also wish to hyperlink some of the URLS? How do I do I do all this? 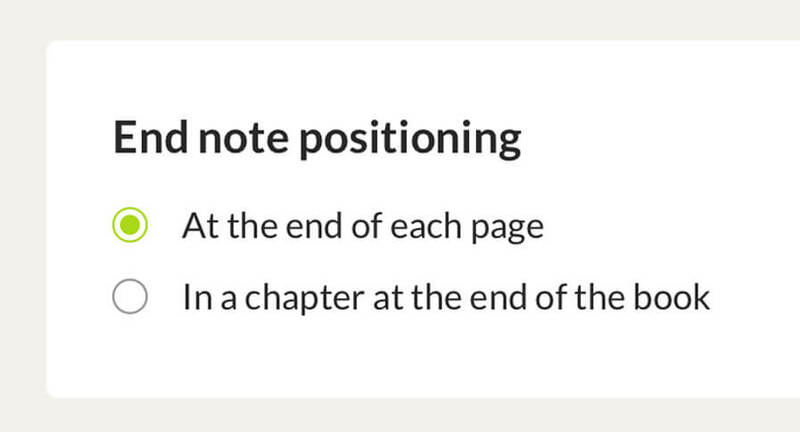 You can select the position of the endnotes on the export page, in the "End note positioning" section. For hyperlinking, just highlight the text you'd like to hyperlink, then click on the link symbol and fill in the link. Hope this helps! Will give it a bash, thank you. What about changing the Roman numerals for 1,2.3. etc? That depends on the template, and right now our templates use Roman numerals, as it is more the standard for typesetting. Thanks. The endnotes insist on going to the end of the chapter? I have set the marker for the endnotes to appear at the end of the book, yet it continues to the end of the chapter. Any ideas? come through in Reedsy. I copied from Apple Pages. Is that the problem? I can't insert scene breaks with a centered group of three asterisks. Is there a work around for this? You can add three-asterisk scene breaks by clicking on the plus sign in the top bar and then on "insert scene break"
I have been having an issue trying to double space my document. I have been trying to figure that out. But overall my book looks good! Any suggestion on how to double space?